Simply put: Massachusetts loves motorcycles. May is Motorcycle Safety Awareness Month, and our Boston motorcycle accident attorneys want to drive home a few points – whether you have been riding for years or just starting. The good news is that fatal motorcycle accidents appear to be declining, if only slightly. There were 4,586 people killed in motorcycle crashes nationally in 2014 (the latest year for which statistics are available) according to the NHTSA. That is a drop of 8 percent from the 4,986 killed in 2012. However, motorcyclists are still 26 times more likely to suffer an injury or death per vehicle mile traveled than occupants of passenger vehicles. For every 100,000 motorcycles registered, 56 were involved in a fatal crash. Compare that to every 100,000 passenger cars, in which 9 will be involved in a fatal crash. They were also five times more likely to be injured. There were 92,000 motorcyclists injured in 2014, which is actually an increase of 4.5 percent from the 88,000 hurt in 2013. That tells us there may be only slightly fewer accidents, but certain protections (such as helmets) may be doing a better job of improving survival odds. And speaking of helmets, we know that is a sensitive issue for some riders, who pride themselves on the freedom to ride with the wind in their hair. But it’s mandated in Massachusetts (per M.G.L. Ch. 90, Section 7) for all riders, regardless of age or experience. We also know that nearly 40 percent of motorcyclists who die in accidents are not wearing helmets – which is a disproportionate figure considering most do wear helmets. 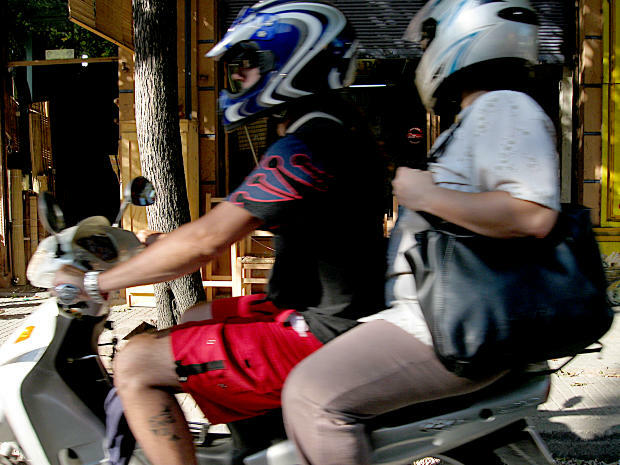 The NHTSA estimates nearly 1,700 lives were saved in 2014 by motorcycle helmets. Unfortunately, motorcyclists have a higher-than-average percentage of operators involved in fatal crashes with a blood-alcohol concentration of 0.08 or higher. While those in passenger cars and light trucks were drunk 22 percent of the time, motorcyclists were drunk 29 percent of the time. That’s not to say motorcyclists are primarily to blame for most accidents (they aren’t) but it’s an issue that deserves our attention. Maintain compulsory liability insurance ($20,000 per person bodily injury, $40,000 per accident bodily liability, $1,000 property damage). On top of that, it is smart to purchase a higher level of insurance, which includes a substantial uninsured/ underinsured motorist coverage plan. Motorcyclists are more frequently the victims of hit-and-run crashes than those in passenger cars. Plus, their injuries are more likely to be very severe. A good insurance plan is one of the best protections you have in case of an accident. Always ride sober, alert and defensively.